This is in my humble opinion the best histamine friendly vegan burger! So, that is some opening statement. I hope you will all agree me, and enjoy this deliciously healthy green monster of a broccoli burger. Give a shout out in the comments section, if you make these and love them. Or let me know on instagram or facebook, I would love to hear from you all. 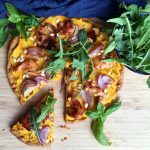 If you have been following this blog for a while, and have been reading the posts, you know that I went vegan for the month of February, as part of a project with a group of people living in the area in and around Eindhoven, The Netherlands, where I live. I learnt a lot during this month, and it brought a lot of new inspiration my way, for which I’m grateful for (even though I’m not going full vegan any time soon). Anyways, during that month I was craving hamburgers, like insane cravings…… So I went looking for a vegan histamine friendly burger option ….. And lets just say that that isn’t easy to find, if you like me can’t have any legumes other than green peas and green beans. 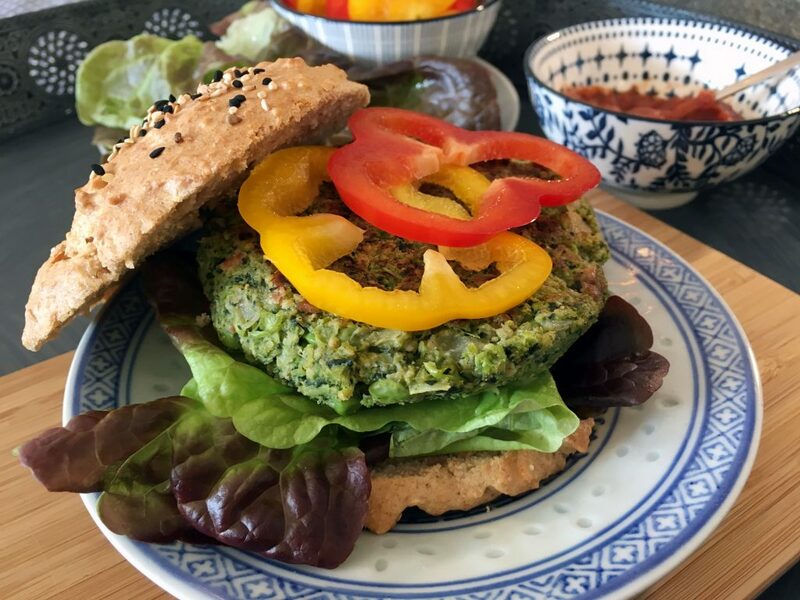 So when I found the recipe for “Green Monster Veggie Burger” by Vegan Heaven, I was over the moon happy. I have made a few adjustments to it, in order for it to be more histamine friendly. And what you see is the result. But the quest didn’t stop here….. because I wanted a burger with a burger bun, and at that point my attempts of baking yeast free breads hadn’t exactly gone great. So I still had one component to solve 😉 The “Cauliflower Sandwich Bread” from last weeks post was the result of my many trials. 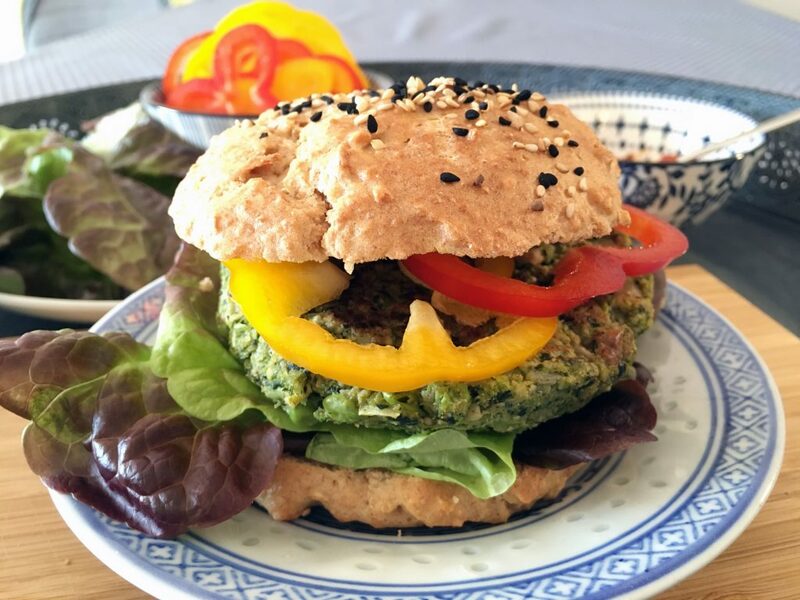 A yeast free, airy and and delicious bun, perfect as a burger bun for this broccoli burger patty. So now for the recipe….. Start with cleaning and preparing all of the vegetable. Bring a big pot of water to the boil, and put in the cavolo nero (or kale), after two minutes add the broccoli florets and let them boil for ca. 5 more minutes. Then add in the frozen peas and boil for two minutes more. Drain (keep some of the cooking liquid) and set aside to allow it to cool down for a bit. 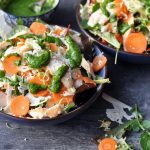 Chop up the celery and add it to a food processor together with the broccoli, cabbage, and peas. Process for a few seconds, make sure to still leave some texture. Transfer to a medium large bowl. In the meantime, heat a little coconut oil in a small pan and sauté the onion for 2-3 minutes (you can also add garlic if you wish). Transfer the onions to the bowl with the broccoli mix. Add the oats, tigernut flour, chopped up nuts of your choice (I used pecans), a bit of the cooking liquid, herbs and salt. Mix it well, I found this easiest to do by hand. If the “dough” is a bit to wet adjust by adding a bit extra of the oats or tigernut flour. If it is too dry add a bit more of the cooking liquid. Form the burger patties with your hands, this portion makes 8 big burger patties, about 1-1½ cm thick. 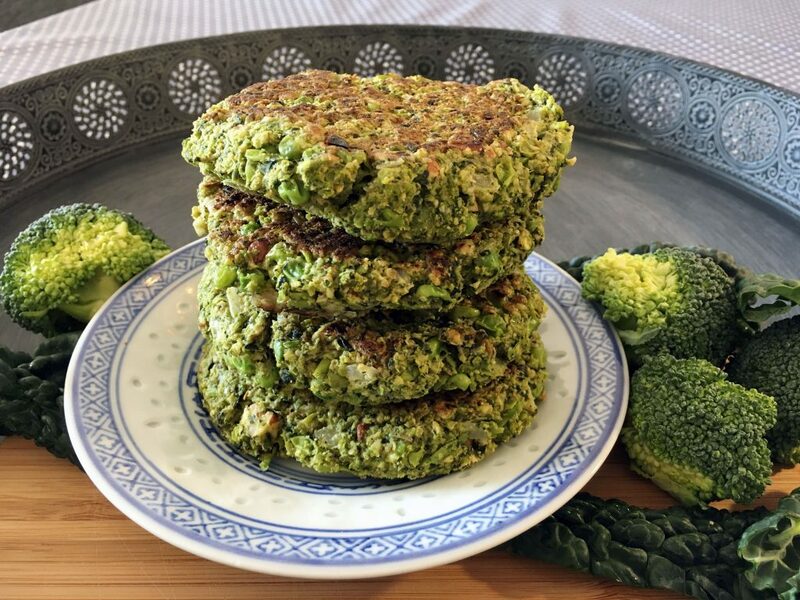 In a large pan, heat some oil and cook the broccoli patties for 2-3 minutes on each side, until golden. Watch out, as they burn easily if you have the heat to high. Serve them on a burger bun (like my “Cauliflower Sandwich Bread“) with lettuce, fresh or grilled veggies, and my great Carrot Ketchup. Or enjoy them together with some fresh salad and some crispy homemade veggie fries. We also enjoy them in pitas or wraps, using them as a kind of falafel replacement together with some freshly prepared yogurt cucumber/mint sauce. How will you serve them? 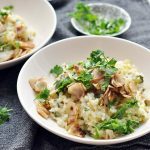 I hope you all really love this recipe! 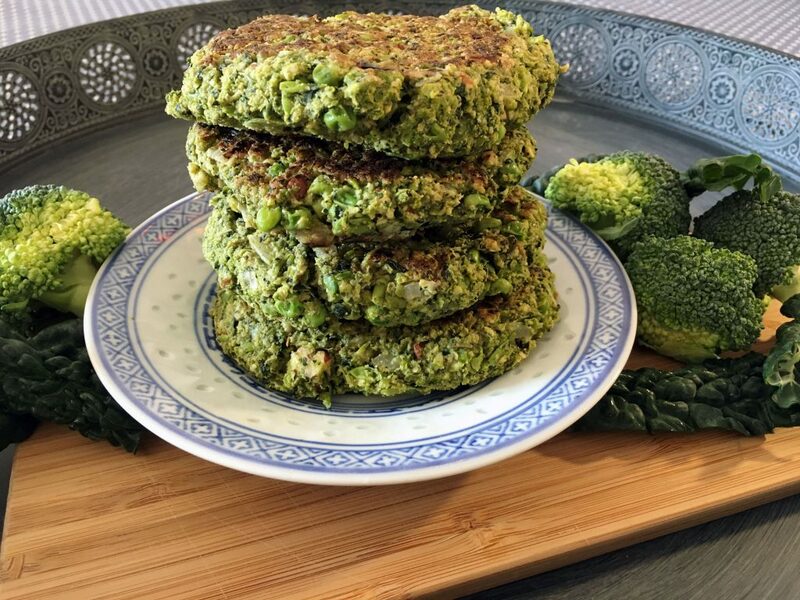 Be sure to leave your feedback and ideas for how to serve up these broccoli burger patties, below. Or share your remarks on Instagram and tag me @histamine_friendly_kitchen and be sure to use my tag #histaminefriendlykitchen or share them on my Facebook page! 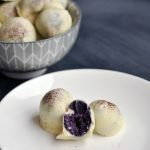 I love hearing from you all, and would love to see your creations and personal twist to my recipes. Start with cleaning and preparing all of the vegetable. Bring a big pot of water to the boil, and put in the cavolo nero (or kale), after two minutes add the broccoli florets and let them boil for ca. 5 more minutes. Then add in the frozen peas and boil for two minutes more. Drain (keep some of the cooking liquid) and set aside to allow it to cool down for a bit. 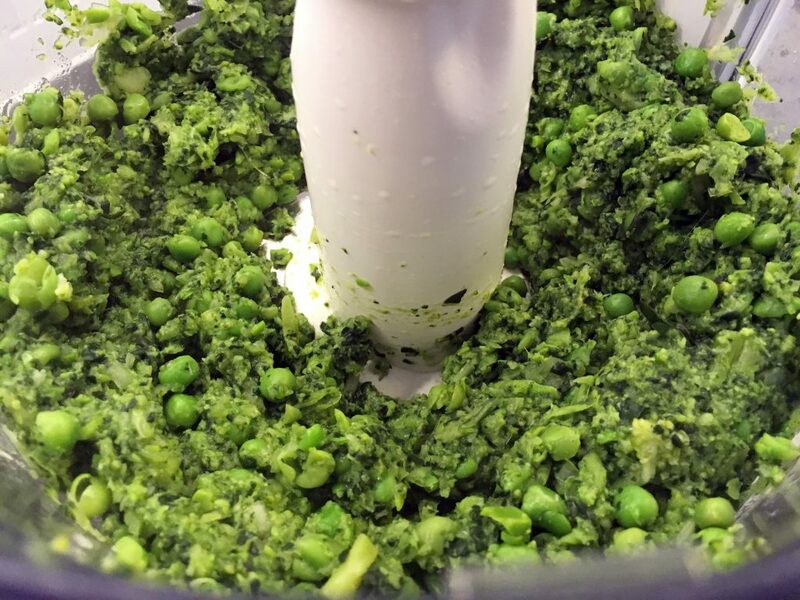 Chop up the celery and add it to a food processor together with the broccoli, cabbage, and peas. Process for a few seconds, make sure to still leave some texture. Transfer to a medium large bowl. In the meantime, heat a little coconut oil in a small pan and sauté the onion for 2-3 minutes (you can also add garlic if you wish). Transfer the onions to the bowl with the broccoli mix. Add the oats, tigernut flour, chopped up nuts of your choice (I used pecans), a bit of the cooking liquid, herbs and salt. Mix it well, I found this easiest to do by hand. 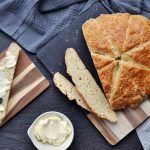 If the “dough” is a bit to wet adjust by adding a bit extra of the oats or tigernut flour. If it is too wet add a bit more of the cooking liquid. And form the burger patties with your hands. This portion makes 8 big burger patties, about 1-1½ cm thick. 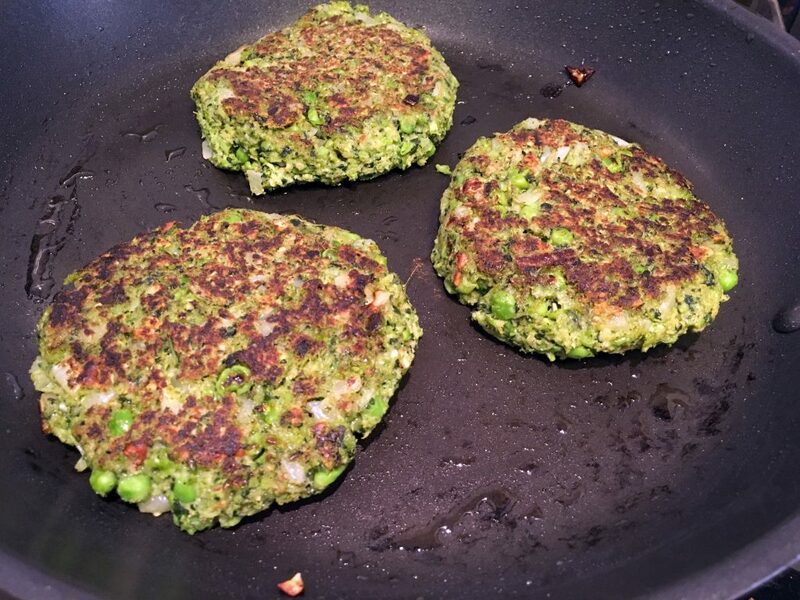 In a large pan, heat some oil and cook the broccoli burger patties for 2-3 minutes on each side, until golden. Watch out the burn easily if you have the heat to high. Serve them on a burger bun (like my yeast free "Cauliflower Sandwich Breads", see link above) with lettuce, fresh or grilled veggies, and my great "Carrot Ketchup" (see link above). These turned out so amazing, thank you!! !